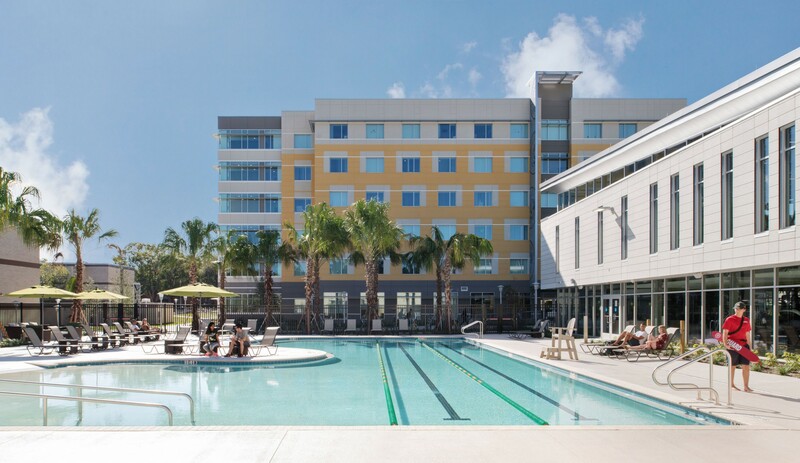 The Village features housing for undergraduate students plus a new dining facility, retail, health and wellness facilities and an outdoor pool. The project is being built in two phases. 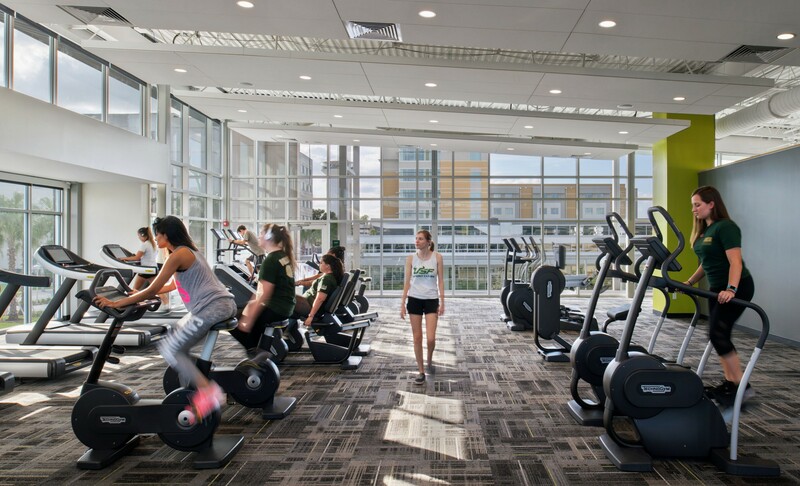 The recently completed first phase began in the spring of 2015 and started with the demolition of four existing residential buildings, a former student union building, adjacent support buildings and an outdoor pool. 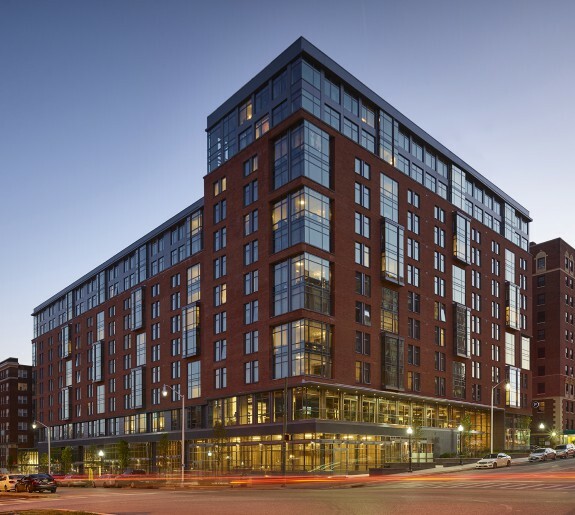 The new construction included three new residential buildings totaling 1,390 beds, plus the dining and wellness facilities. Phase I was completed timely for August 2017 occupancy. Phase II includes the demolition of the remaining residential and support facilities and the construction of the final two residential buildings, to bring an additional 781 beds online for August 2018 occupancy. 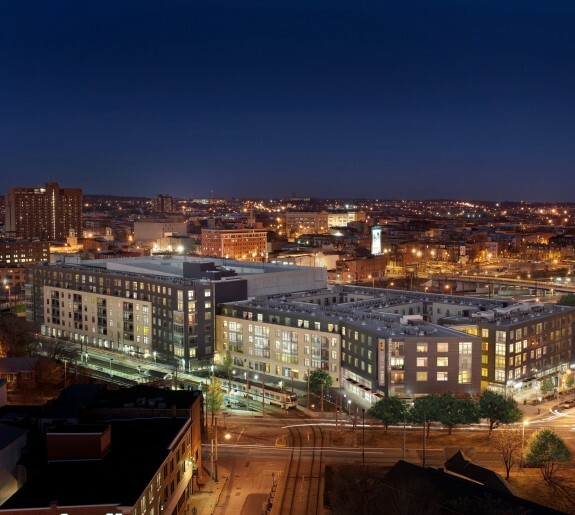 The project is currently targeting LEED Silver. 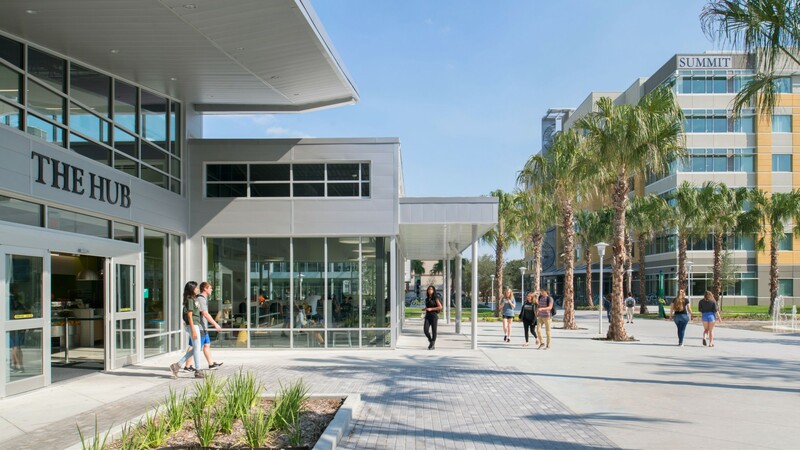 The design of the Village integrates a wide range of campus uses to create an optimal living and learning environment that will enhance the student life experience. 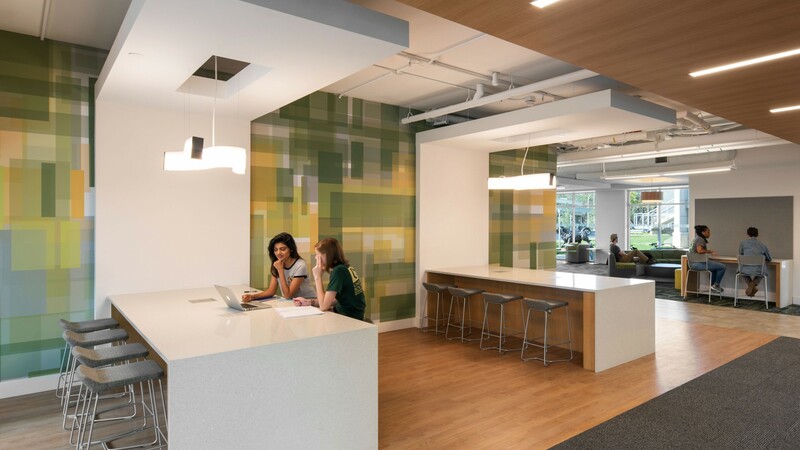 The strength of Design Collective’s Master Plan lies within the relationships of the buildings and open spaces. The design parti establishes formal and informal, public and private spaces to foster social interaction and a dynamic setting. Major dining, wellness, retail and residential amenity uses are organized around prominent open spaces to create a vibrant, community core. The amenity space and flex classrooms within the live-learn communities also strategically line and open onto the Village Terrace, Flex Lawn, Overlook, and Promenade. 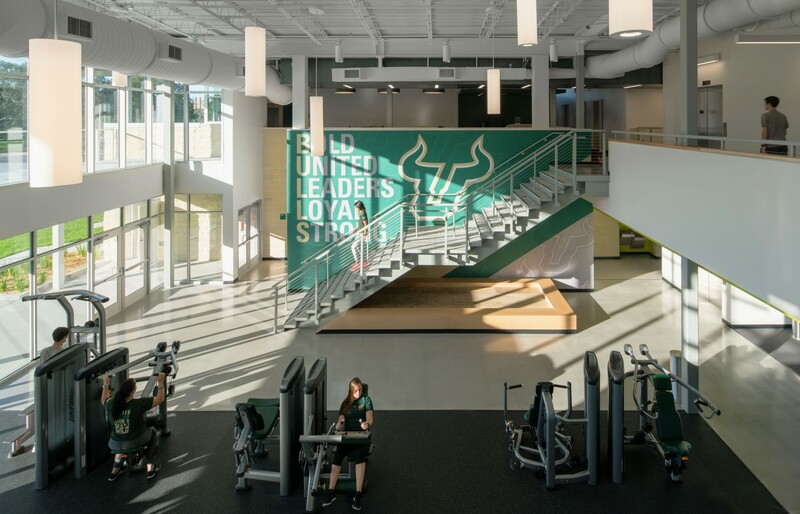 The synergy of these uses establishes the opportunity to weave USF’s academic, residence life, and community goals into a cohesive student-centered environment, creating a unique sense of place that strengthens the greater campus and surrounding community. An extensive open space and circulation network ties existing natural features to a variety of active public spaces and adjacent program components. 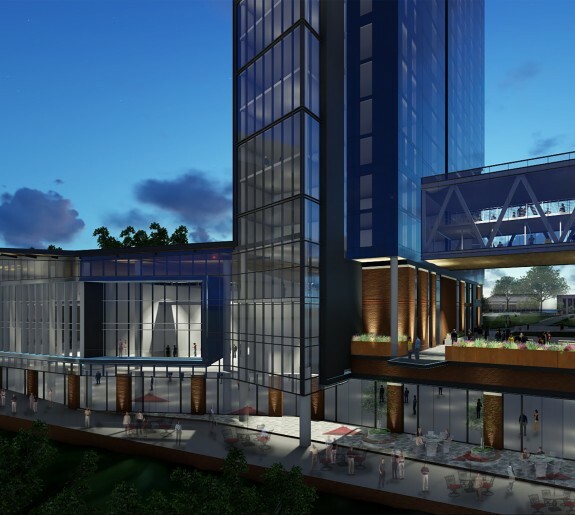 The placement of the retail, dining, wellness, and recreation components of the program creates a connected spine of social space that activates the Flex Lawn, Overlook, and Terrace and frames prominent circulation paths. This critical synergy of retail, restaurants, dining, wellness, and outdoor amenity create an engaging student-centered environment. 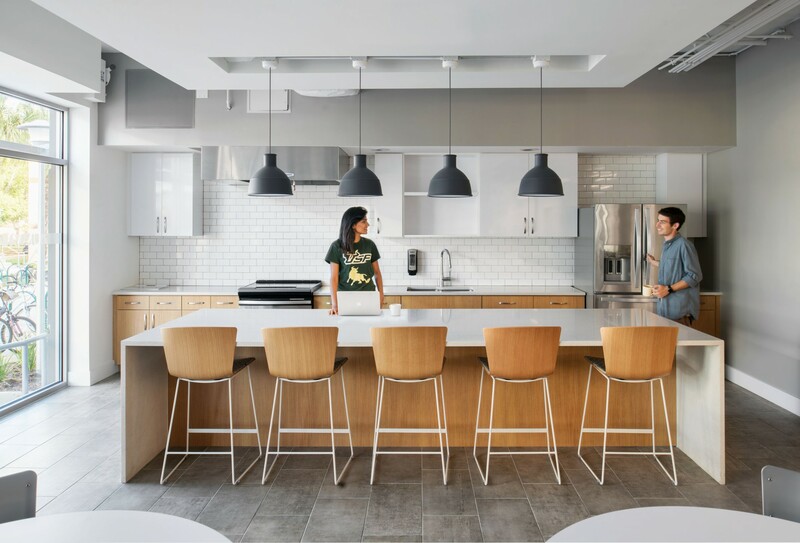 The Dining and Wellness Facilities incorporated sustainable principles as an active educational tool. 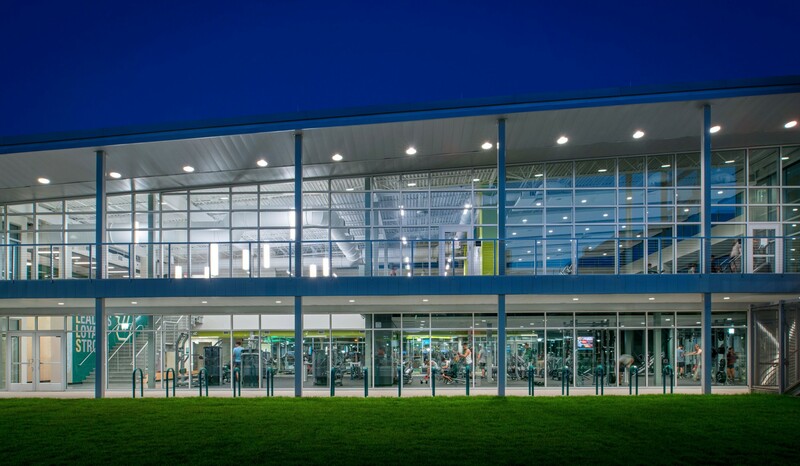 The western facade of the wellness center is treated with a layering of daylight controls to reduce energy loads. The butterfly roof is finished with a high-albedo surface to reduce urban heat island effect and provide optimal angles for solar panels. Rain water conservation is achieved through a gutter/rain chain system. 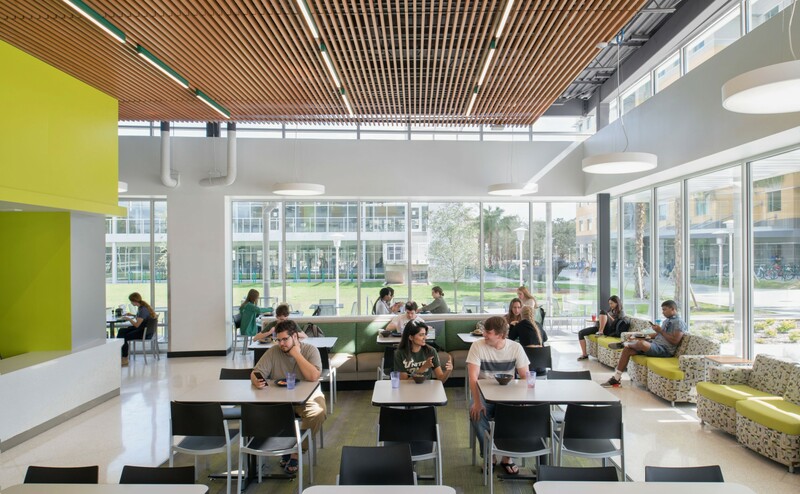 Most notably the residential buildings focus on solar orientation, day lighting to reduce artificial lighting costs and improve student well-being. 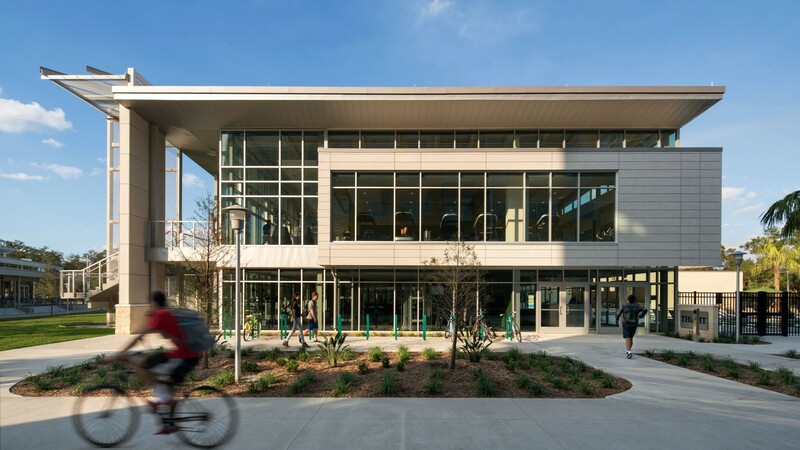 The architectural balance of sun shades, canopies, and punched openings are achieved with sustainability in mind, as most of the transparent portions of the building are located in the north and south orientations, with overhangs that reduce glare. 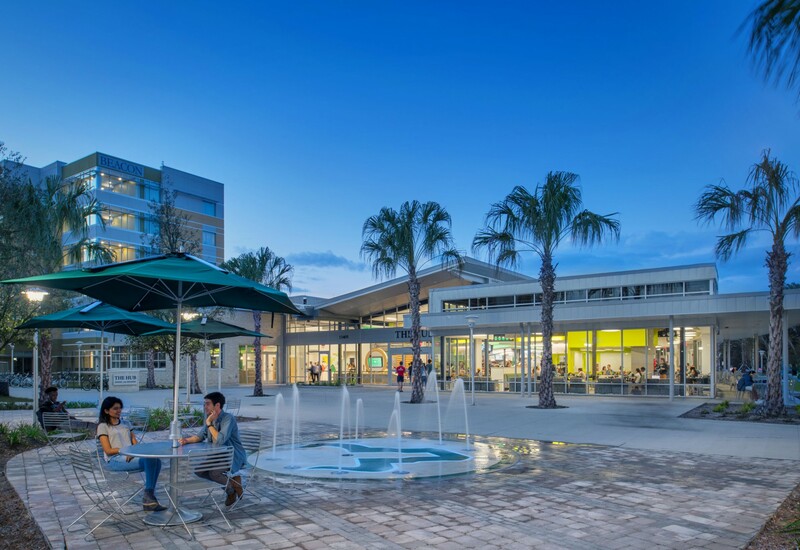 The landscaped green spaces preserved and celebrated the existing Live Oak trees while providing additional opportunities for engaging with the environment of the Village.